Are you someone who delays the inevitable, pressing the snooze button just one more time to get an extra few minutes sleep in the morning? And then once you’re finally up, you’re against the clock to get out the door in time? You’re not the only one. 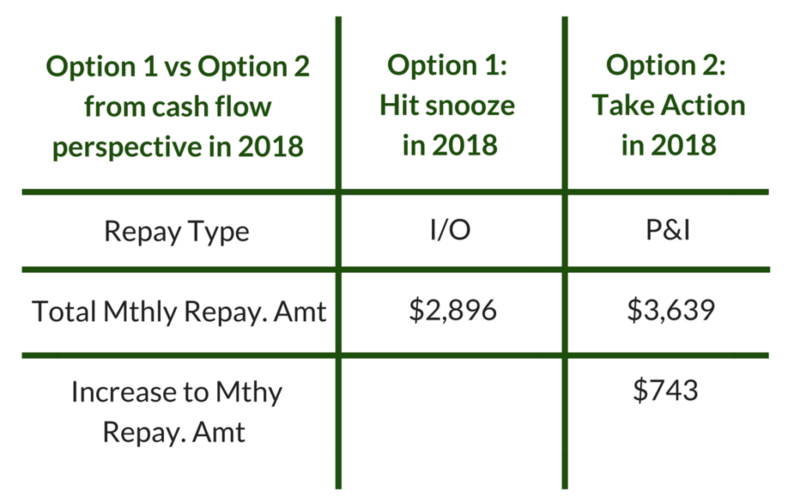 Knowing your Interest Only (I/O) loans are set to expire soon and choosing NOT to review your strategy now, is a bit like hitting the snooze button. Perhaps you already know you should do something about it but like the comfort of making interest only repayments. Perhaps it’s not that at all and you haven’t even thought about it yet. Why are Interest Only loans getting all the attention? Due to persistent concerns about rising household debt levels, regulators want to see lenders reduce the amount of Interest Only lending. The simple reason being that borrowers who make I/O repayments do not actually pay down their debt – they just cover the interest charges. APRA and ASIC have imposed tighter lending restrictions in a number of areas which has reduced borrowing capacity across the board. It’s extremely likely that you personally can’t borrow as much money as you could 3 years ago, even though interest rates remain historically low. We want to focus solely on Interest Only loans here because they are getting increasingly more difficult (and costly) to obtain. We also want to make sure that all borrowers making I/O repayments understand how industry changes impact them personally. But I don’t have plans to borrow any more money, so how does this affect me? The reduction in borrowing capacities doesn’t only affect buyers qualifying for new loans, it affects you if you are making Interest Only repayments. Long gone are the days where you could simply ask your lender to extend the I/O period with a simple phone call. Now, you need to re-qualify for your loan based on today’s lending criteria. But since borrowing capacities have drastically contracted, on paper, some borrowers don’t actually qualify for the Interest Only loans they already have – despite having a strong income and solid property portfolio. So once your Interest Only period expires, instead of simply extending it or refinancing to another lender to reset the loan term (a common strategy used by property investors), you may have no choice but to start making higher Principal & Interest (P&I) repayments. How are my new Principal & Interest repayments calculated? Once the Interest Only term expires, the Principal & Interest repayment is calculated over the remaining loan term. For example, if you have a 30 year loan term and have enjoyed 5 years making I/O repayments, the P&I loan repayment at the end of these 5 years will be calculated over 25 years (30 – 5 = 25 years left remaining of the loan term). If you enjoyed a 15 year I/O period, the new P/I repayment would be calculated over the remaining 15 years. The shorter the remaining loan term, the higher your P/I repayments will be. 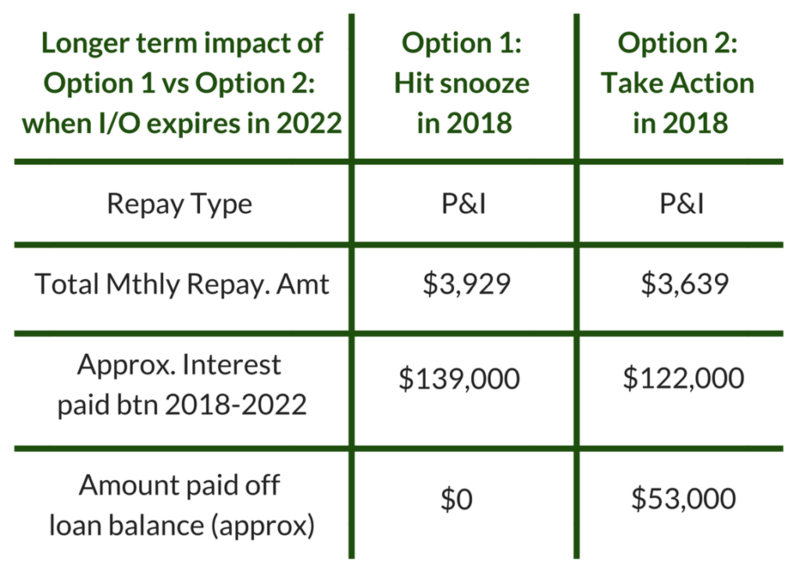 Likewise, the bigger the gap between what you’re paying in I/O repayments now and what you’ll pay when your loan converts to P&I repayments when your I/O period expires. How much higher will the Principal & Interest repayments be? Let’s look at the following example from a property investor we assisted recently. Lisa had a combination of fixed loans, variable loans, investment loans (I/O repayments) and owner occupied loans (P&I repayments). To keep things simple, we’re just going to look specifically at two of Lisa’s variable Interest Only investment loans. Lisa was making Interest Only repayments on these loans and the I/O term was set to expire in 2022. Lisa had been making I/O repayments on these loans for 1 year. On these 2 investment loans, Lisa was paying $34,752 p.a interest or $2,896 in monthly loan repayments. In the context of Lisa’s entire loan portfolio, the likelihood of being able to extend (or reset) the Interest Only period on ALL her I/O loans once they expired in 2022 was unlikely due to restrictions on borrowing capacity. It didn’t help that another three of Lisa’s I/O loans (not shown here), were also set to expire around the same time. 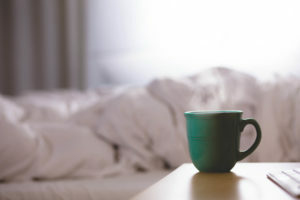 Lisa wanted to investigate the longer term impact of, “Hitting the snooze button” or “Taking action now.” Let’s compare the options here. Once the I/O period expires in 2022, Lisa would then start making P&I repayments on here loans. These repayments would be calculated over the 25 years left on her loan. Please note the interest rate is lower because P/I repayments attract a lower interest rate. The rates we’ve used below are based on today’s P&I rates. It’s extremely likely that interest rates – and perhaps even the price differential between I/O & P&I rates – will increase between now and 2022. This means that the quoted monthly repayments below are likely to be understated. Taking action requires Lisa to switch her I/O repayments to P/I repayments now. Her new total P&I monthly repayments will be based on a remaining loan term of 29 years (instead of 25 years in Option 1). If Lisa hits the snooze button until the I/O terms expire in 2022, over the next 4 years she will pay approximately $139,000 in interest. Since Lisa is making Interest Only repayments, she will pay nothing off the balance of her loans. In 2022, her estimated new total monthly repayment amount is $3,639 (increasing her monthly repayment by $1,033 compared to the I/O repayments she is making now). Taking action now means Lisa’s monthly repayment amount will increase by $743 (instead of $1,033 if she waits until 2022 to switch to P/I). It also means that when 2022 comes around, she will have paid approximately $122,000 in interest (an interest saving of approx. $17,000) AND paid approx. $53,000 off her loans. Side note: Lisa decided to convert the above investment loans over to P/I, but left other loans in her portfolio as Interest Only – to help manage the impact on cash flow. Are you really suggesting I choose to make higher Principal & Interest monthly repayments now, before I have to switch over? It’s our job to interpret regulations and complex lending policy and convert it into actionable strategy that saves you money and helps you build wealth. We know this message isn’t always popular with long term property investors – we’re certainly not suggesting it’s a ‘one-size-fits-all’ approach. And we also know that finding an extra $743/ month is easier said than done. There’s still a place for I/O loans, but only if you have a well considered plan for when the I/O term expires. Whilst no one can be certain of how industry changes will play out, in our almost-two-decades of experience, we’ve never seen lenders tighten policies so rapidly in such a short space of time. When you combine this with everything else that’s happening in the banking industry, we suspect the scrutiny of I/O loans won’t disappear anytime soon. If we adopt a forward-thinking proactive approach and accept that P&I will be the new norm moving forward, knowing the alarm is set to go off, we feel it makes sense to convert your loans to P&I sooner rather than later. That’s all well and good, but I’m not touching my Interest Only loans until I have to. That’s completely fine – they are your loans and you’re the one making the repayments! This is not a strategy everyone will want to implement. If you decide to wait in the hope you can reset your I/O loans in a few years time, we suggest you do everything in the meantime to improve your borrowing position. We fully acknowledge that paying down your loans is nowhere near as exciting as using every little bit of spare cash to grow your property portfolio. Boy, do we get it. The thing is though, reducing debt is the smartest (and safest way) to accumulate wealth over time, especially in times of great change. We need to remember that everything runs in cycles and in the current environment, good old-fashioned principles of ‘paying down debt’, only ‘borrowing what you need’ and ‘spending less than you earn’ may sound boring, but they work. It’s time to stop hitting the snooze button.